The Chinese guqin is a “philosopher’s instrument,” meaning that it is intended as a tool for the player’s meditation rather than for a listening audience. Aside from being difficult to master, the instrument itself has a deceptively complex construction based on Confucian principles. This is not the best quality video, but it shows the instrument with its natural sound in a realistic setting. The guqin is not a concert instrument and the sound is not very loud. Most performance videos show more virtuosic playing with an amplified sound. “Lira organizzata” is a real hybrid instrument that had a brief popularity from the late 18th-early 19th centuries. It was a combined hurdy-gurdy (aka “lira”, “vielle a roue”, etc.) and a small organ similar to the early portativ (thus an “organized lira”). The organ and lira could be played independently or in combination. Music for this instrument was written by Haydn, Pleyel, and a few lesser known composers. The few historical examples in museums are apparently in rather awful condition. But the Viennese luthier Wolfgang Weichselbaumer has created a modern reproduction that is beautiful in both sound and appearance. I have come across some impressive videos by Spanish musician Germán Díaz playing Weichselbaumer’s instrument. They are well worth hearing, as are videos of Díaz playing other hurdy-gurdies. I sometimes wonder about how people make a living in the arts. When it comes to musical instrument making, there is a fairly constant demand for guitars and so on, but what about very rare, high end instruments that are only occasionally used, are difficult and expensive to manufacture, and almost never actually need to be replaced? I’m thinking especially about tuned percussion instruments like orchestral bells, xylophones, and celestas. Not to mention the ultimate tuned percussion instrument: the carillon. It’s true that these objects sometimes break or need maintenance or repair. But they don’t really wear out. When it comes to celestas, individual musicians are rarely owners. Instead, they are generally owned by orchestras (or schools) and are played by a pianist hired for the rare occasion that the instrument is called for. It’s safe to say that, were it not for the “Dance of the Sugarplum Fairies” in Tchaikovsky’s Nutcracker ballet, there would be far fewer celestas and celesta players in the world. A celesta rarely needs tuning or regulation unless it has been abused. Even a basic new celesta by Yamaha costs over $15,000, comparable to the cost of a grand piano. So how does a maker find enough buyers for high end hand-made celestas to have a viable manufacturing operation with artisan employees having the specific skillsets required? My guess is that all it takes is creating a superior product and having almost no competition worldwide. Here is an interesting video about the German maker Schiedmayer. You may notice towards the end that the instrument is crated up and shipped to a dealer in China. I have often though of musical instruments as a curious compromise between sound and interface. The standard designs of the major instrument types — keyboards, fretted necks, valves, fingerholes, etc. — have become standard in part because no one has figured out a compellingly better way to control an instrument’s sound in a way that is also sonically acceptable. Then comes electronics, which separate the interface system from the acoustic system, allowing for much greater experimentation in ergonomic and haptic interface design. A vintage Hammond B6 organ doesn’t need a keyboard, and in fact is available as a sound file for use in any MIDI-capable device. Similarly, guitar modelers are becoming commonplace, allowing a Fender Stratocaster to sound like a Ramirez classical guitar. Or, at least in theory, for a cheap violin to sound like a Stradivari. The interface is, of course, directly connected to the nuances of sound production in an acoustical instrument. While you can get superb guitar sounds for a keyboard synth, the keyboard is not the ideal interface for creating a performance that sounds precisely like a guitar. But freeing the interface has interesting implications for the performance of new music. In fact, an interface could provide only visual and haptic cues while the actual sensor device is not so obvious. 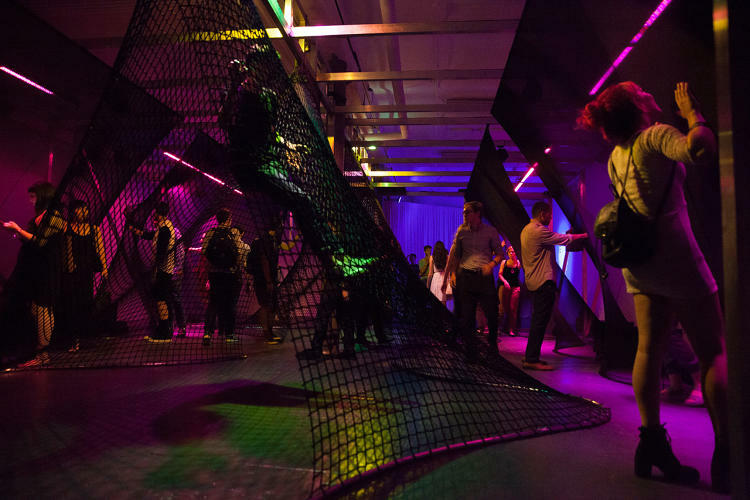 I lovely example is this interactive environmental installation in The New Museum (NYC), in which spandex screens and nets are hung on frames for people to interact with, but their interactions are detected by a set of Microsoft Kinect devices. So it feels like the hanging objects are controlling the sounds, but in fact it is the users’ motions and position that are being detected. The world of pianos has experienced continual development since Bartolomeo Cristofori invented his cimbalo di piano e forte around 1700. The 20th and 21st centuries have proven no less innovative than the 18th and 19th, despite the apparent superficial standardization of the last 100 years or so. Even the venerable institution of Steinway & Sons is constantly refining the subtle minutiae of design in frame, soundboard, and action, and every Steinway piano has its own personality that can be discerned by an astute player. Add to that the continuous invention of more extreme design elements, from alternative keyboard layouts to experimental aerodynamic cases that modern designers like to present to the world as the Next Generation Piano. The most visible example probably being the Schimmel Pegasus created in the late 1990s by designer Luigi Colani. The Pegasus is an ultramodern design on all levels, not just the most obvious curvilinear case. More recently a similarly liquid form was presented in Budapest by maker Gergely Bogányi touted as the “first major redesign of a piano seen in over 100 years,” which is an absurd statement that I think only takes away from the interesting aspects of the instrument. The latest entry into the world of hyperbolic piano marketing is no less than stellar pianist and conductor Daniel Barenboim. Despite numerous statements about how his new piano design harkens back to the earlier days of the fortepiano’s evolution from the harpsichord, Barenboim’s piano is described as “radical.” If anything, it’s the antithesis of radical. It seems more of a traditional approach, using modern technology to reverse the earlier innovation of crossing the strings on the lower end, which was done primarily to prevent the instrument from being too long, but also has the effect of blending the tone is a way that has become the sound one expects from a piano. Barenboim’s design concept is simply to uncross the piano harp in order to undo the blending and to yield a clearer tone on the bottom end. A perfectly reasonable idea as long as this doesn’t result in a piano that’s 10 feet long or more. The articles about the Barenboim instrument do not go into technical details. It was built by Belgian instrument maker Chris Maene under the auspices of Steinway. In what I can only describe as an exercise in pointless ostentaion, Gibson has partnered with high-fashion Hong Kong jeweler Aaron Shum to create what is touted as the “world’s most valuable guitar.” And apparently that is its raison d’etre as it was certified by Guiness for a world record at the Baselworld jewelry show. 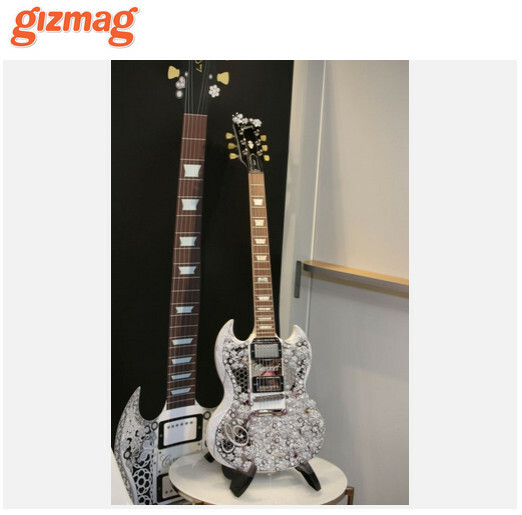 A Gibson SG model encrusted with 400 carats of diamonds and 1.6 kilograms of 18k gold, they claim the instrument is worth a cool $2 million. At the unveiling they had an unnamed rocker shred a couple of riffs on the thing to prove that it was playable. I look forward to manufacturers of other items not usually associated with jewelry to offer similarly glitzy versions of hand tools, vacuum cleaners, or bicycle tire pumps. I think they may have a record for “most expensive,” but I would nominate any number of guitars among the “most valuable.” Like B.B. King’s “Lucille,” or Clapton’s “Blackie,” or Hendrix’s 1968 Stratocaster. I came across this intriguing gadget on Kickstarter. They have already surpassed their goal by 10 times. The instrument is currently available only through their Kickstarter campaign, which expires 13 April. They have announced no plans to distribute the product through some other retail scheme, but it seems likely that their success here will change that. The Antiphon is not technically a musical instrument at all, but rather just a MIDI controller device. You need a synthesizer or other software instrument (like Garage Band) to make it sound. What makes it different is the ability of the user to play it in a number of different ways that are software-configured using an iOS phone or tablet. They are working on an Android version, but make no promises about that. It can be used without the configuring software like any MIDI controller, but the software lets you create unique custom configurations. The video shows the controller being used as a guitar, a violin, a keyboard, and a drum pad. These things always look easier in promotional videos than they turn out to actually be, but it does seem to be an intelligent and ergonomic design. One could easily imagine an expanded version similar to the Chapman Stick, but their design philosophy is wisely to keep it simple. It’s obviously working since their Kickstarter has already sold nearly 1800 of them. We’ll be watching to see how they are reviewed by actual buyers. Artiphon INSTRUMENT 1 – First Impressions from Artiphon on Vimeo. As a counter to the previous article profiling the “world’s largest piano,” this time we highlight its opposite. You have to admire the skill and craftsmanship and dedication of someone who takes 16 years to build an exact functioning 1:7 scale replica of a Steinway art case piano. Note that when I say “functioning” I mean that all 12K parts were faithfully reproduced and work more or less as they are supposed to. This does not mean you can play music on it, and in fact the one thing they do not show you amongst all the wow factors is someone trying to play it. Which as always begs the question, “What’s the point?” When you have the original of something, and especially a musical instrument, what is gained by making a perfect replica in miniature that doesn’t actually perform the original’s primary function? It’s certainly a staggering intellectual achievement, and there is no doubt that the artist knows more about what goes into making a Steinway than just about anyone else on the planet who doesn’t actually work at Steinway. As a delicate piece of craft it is certainly stunning to look at. But as with any replica, the true artistic vision must be credited to the designer and makers of the original object. Whether the original of this particular obsession is an artwork worthy of such devotion is a whole other discussion. The original article from Steinway is here.